A small and simple apartment of only R500,000! In this edition of homify 360, we look at a small apartment that’s filled with gorgeous style, sophisticated colour and chic detail. The old city home located in Boston was in desperate need of some modern minimalist elements. 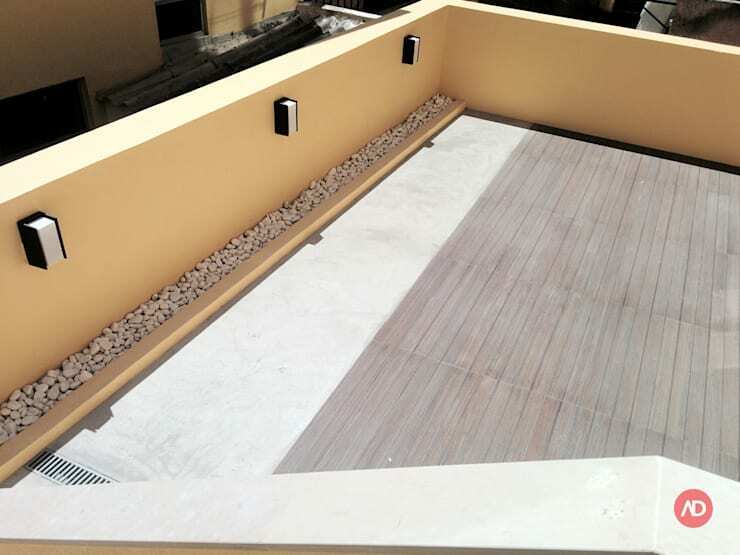 The team of fantastic architects ensured that the needs of the owners were met in every regard, in a bid to get this apartment looking dynamic, contemporary and full of life again. But wait until you see the storage solutions that have been included in this living space, that create an impression of outstanding area. This elegant doorway is an upgraded version of the previous entrance to the building. 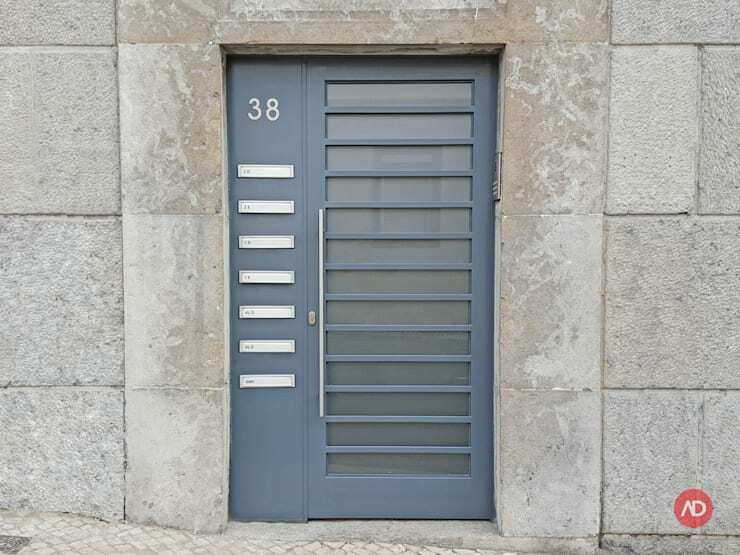 The pale blue door is sophisticated and elegant, while the concrete surroundings adds a low key yet stylish element to the building that is contrasting yet attractive. 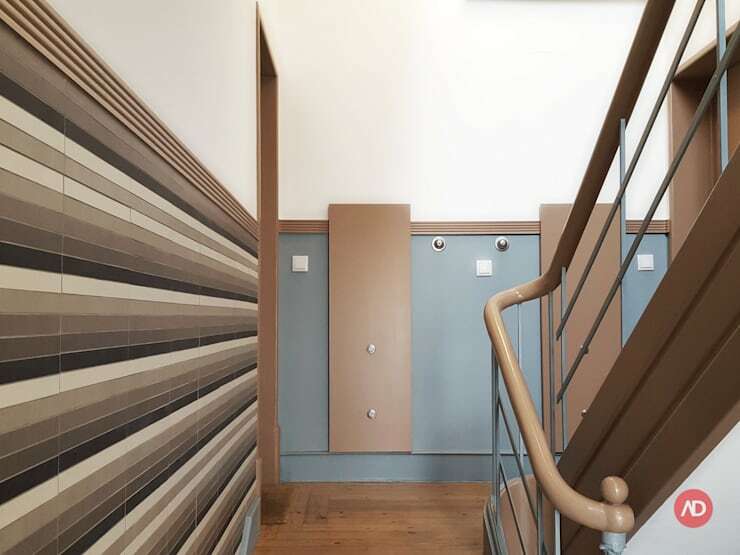 The staircase that leads to this modern apartment is rather unusual and unique, especially when compared to other modern apartment buildings. The design team opted to create a different yet memorable setting for this staircase. The use of an interesting colour combination that includes dark chocolate, mocha and cream coloured tiles creates a stunning feature that is enhanced by the pale duck egg blue of the back wall and caramel tones of the wooden rails and doorway. Storage is essential especially in an apartment, and this closet is exceptional, allowing forof space for clothes, shoes, linen and even bedding. It’s an inexpensive solution to get your storage in order and your home organised. 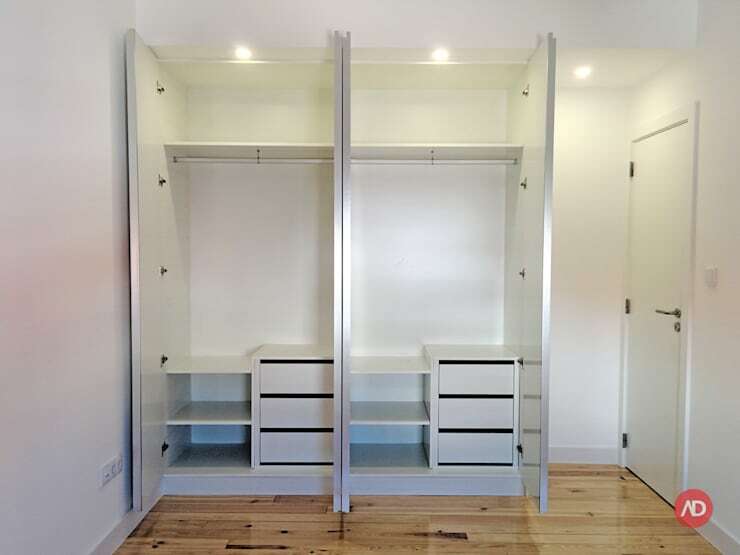 The contemporary design allows this closet to suit any home regardless of size, space and even budget. This contemporary kitchen is great for a modern, busy home environment. The space has been designed with sleek style in mind, while quality materials ensure that the area is hard wearing too. 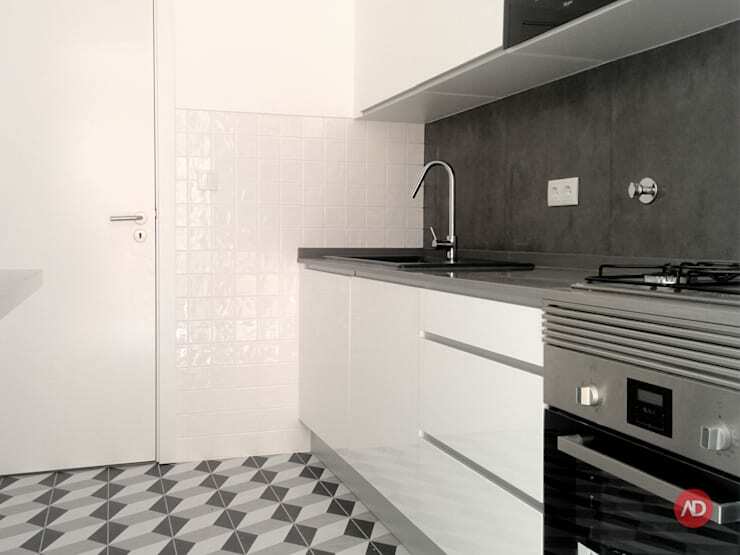 The state of the art modern appliances, fixtures and fittings incorporated in the kitchen are the perfect addition to the space, while the strict colour combination of charcoal, white, grey and black along with the geometric patterned tiling is gorgeous. 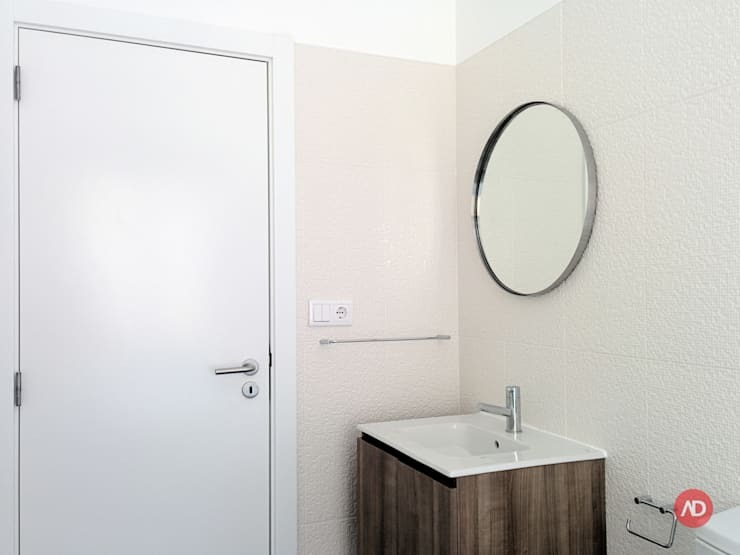 The bathroom in this apartment is unbelievably small and modest, but that doesn’t mean that it cannot make an impact on the designer effect of the home either. The design is unpretentious and simple, allowing this bathroom to remain elegant, trendy and tasteful for many years. The ceramic basin and wooden vanity have a retro inspired design too, making this bathroom aesthetically appealing. The colour scheme is different, yet luxurious, with silver and rose pink adding a sparkle of sorts. We have to head to the patio of this excellent city apartment before we complete this Ideabook. City views, panoramic sights and fresh air creates a comfortable and relaxing area that is not too far from the interior. A patio is a great way to enjoy everything that a home has to offer, now just to grab a delicious cup of coffee and take in the atmosphere or how about planning that social event with loved ones and get your grill going? A small but beautiful house that this couple built on a tiny budget is another beauty.